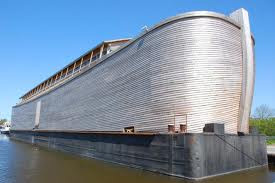 KayKiSpeaks.com: Bizarre News: Dutch man replicates Noah's Ark! An hour away from Amsterdam in Dordrecht, Netherlands, a man is building a full-scale replica of Noah's Ark. Expert builder Johan Huibers has been constructing the ship for the past three years and it's in biblical proportions. The ship is four stories high and the length of a football field. And, it really does sail! Amazing, huh? How did this man get the idea? Well, Huibers had a nightmare. In an interview with The Today Show, he dreamed Holland suffered a great flood. The next morning, he woke up determined to start preparing for that worst-case scenario. The ship has generated online buzz and is close to being completed. It will be a tourist attraction with a biblical theme, replete with life-size (and real) animals two-by-two. Huibers plans to sail up the Thames River in time for the Olympics next year. Wouldn't you love to ride? Check out the video below.